Deferred Consumption: Why is everyone moving to Provo? Lately I've been trying to get a handle on population trends around SLC and Utah in general. 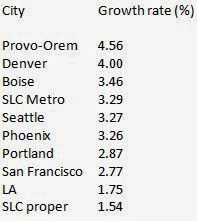 What I've failed to mention is the fact that over the last several years Provo-Orem and St George have among the highest population growth rates not only in Utah, but also in the nation. The Provo-Orem and SLC metropolitan areas are doing a fabulous job attracting residents (Provo especially). And to be strict about the comparison, Provo proper attracted 3431 people from 2010-2012 compared to a gain of only 2874 people for SLC proper (and SLC is ~50% bigger!). So, what are Provo, St George, and the SLC 'burbs doing right that SLC proper is not? As people are a city's lifeblood and tax base, it's in their best interest to attract people. Other than onerous parking minimums, there are other notable policy oddities in SLC and in the coming days we'll try and tease out what's causing people to shun the capitol. 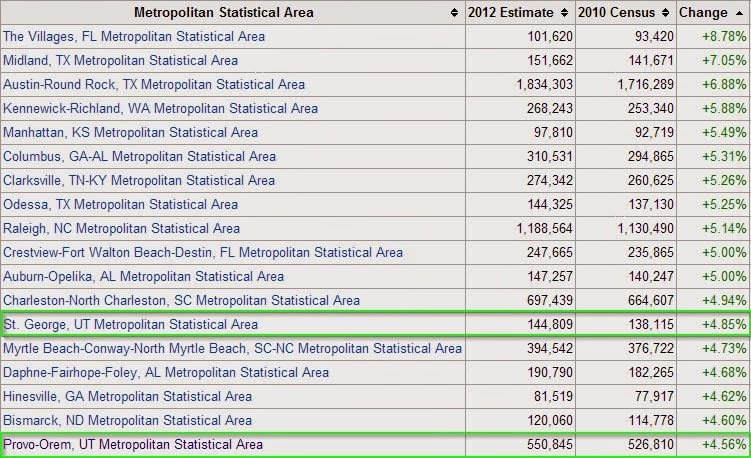 Note: The data in this post are from here and here. Check it out!